Does the Doane Stuart logo on the front cover look a little different? Maybe even retro? Well it should becuase it’s the original Doane Stuart Logo from 1975.! Our fortieth year is an important time to renew and celebrate the values we inherited from St. Agnes and Kenwood and to take a look at ourselves as we contemplate the future for Doane Stuart. We inherited the purposefulness of a serious academic program, and we have continued the tradition of excellence. We were bequeathed our determination to hold high lives of faith; however, rather than choosing between the Episcopal St. Agnes and the Catholic Kenwood, we elected to be Interfaith, to celebrate all religions and to understand the beauty and benefit of a life of faith. During this 40th year we are orchestrating a strategic planning process; we are surveying the faculty and parents, students and alumnae/i and we will detail our needs, wants and plans for the future. We will examine our academic, arts and athletic programs, and we will set priorities for the next 3-7 years. Our Board of Trustees started our process with several hours of reflection and reinforcing our prime values of inclusivity, of serving students “from every quarter” and of always aiming at excellence. Enjoy our Pennant, please. – St. Agnes School of Loudonville, and Kenwood Academy in Albany, merged to form one interfaith school. Forged out of the hard work and tireless dedication to the ideals of both schools, Doane Stuart makes a statement about the importance of building a community that has at its core intellectual curiosity, understanding and respect. “ The atmospher e he educators that promotes serious study. The principles central to our historic predecessors – Kenwood’s commitment to providing an education for students from every quarter and St. Agnes’ sincere welcoming of students of all faiths - comprise the core of a mission that inspires and grounds us. We provide an education for all, promote the joy of discovery, educate to social responsibility and lay the foundation for a strong faith by promoting interfaith dialogue and teaching the basic tenets of all religions. er e at Doane Stuar t is almost electric. Doane Stuart moves to its current location at 199 Washington Avenue in Rensselaer. Doane Stuart’s 40th year had its official start at our Convocation ceremony on Wednesday, September 9, 2015 in the Golub Interfaith Chapel. This annual Doane Stuart tradition kicks off the year as students, faculty and staff gather to begin the process of once again binding our learning community together with shared goals and interests. Mr. Hodgkinson opened the ceremony with a prayer and a warm welcome and at the end of the service, bells were rung to start the year’s journey. This year we were honored to welcome Mrs. Elle Houle Dietemann and Mrs. Christine Roy Faber who joined us to ring in the new year. Mrs. Dietemann and Mrs. Faber are members of the class of 1976, the first senior class in what was, in September 1975, the first year we opened as The Doane Stuart School. Mrs. Sharon Duker, President of the Board of Trustees, offered the closing prayer. While the first day of school rang in the School Year, The 3rd annual Back-to-School Barbecue was the setting for our official kick-off to the anniversary year’s celebrations. Over 350 members of the community helped us celebrate. The perfect fall evening started with an exciting boys soccer match against New Lebanon. The Thunderchickens won 3-2 with an impressive final goal by Joey Rocchio ‘16, of Castleton. Following the game, everyone enjoyed great food, great friends and great school spirit! A huge thank you to Mona Golub (parent of Ira ‘15 and member of the Board of Trustees) and Price Chopper’s House of Barbecue, for cooking delicious hot dogs, hamburgers, potato salad and macaroni salad, and to the families that brought side dishes and desserts. where new students and new faculty race in pairs down the gym towards a person holding a bowl containing green and blue strips. (The bowl might move as the pair approaches.) The winner chooses a green or blue ribbon and the other person gets the other color—they have now officially joined the Blue or Green Team. This was an important tradition at St Agnes. Then we play LOUP; one whole team hides someplace in the school, and the other team tries to find them. This was a Kenwood tradition on Corn Roast. So two traditions have been melded—joining our two predecessors together! Who knew? A Lifetime of dedication A first-hand account of an extraodinary womam's place in Doane Stuart history. 1970, and the only one who made law review. Right after graduation, she went to work for the New York State Department of Public Service, which makes sure that we all have electricity and water and other essential services at a fair price. She wrote the public utility law in the State of New York for forty years. Her legislation was cutting-edge; it drew inspiration from models in other states and from the latest academic work. My mom Jean Beverly Kosinski Cleary graduated Kenwood in 1959 and watched over me as I progressed through Doane Stuart from pre-K until my high school graduation in 1989. She served on the Board of Trustees for twenty years, from 1975 until 1994. Her life, and my life, were entwined with the life of Doane Stuart for my whole childhood. It is my privilege to share some of my memories of And third, Mom was committed to Doane Stuthat time with you. art. She was recruited to the Board of Trustees I think that some people may have a great va- as a young alumna, a bit more than 15 years afriety of projects in their adult life; a series of ter her high school graduation, at the moment community endeavors and hobbies. Not Jean of Doane Stuart’s creation. She was there for B., as my brothers call her. She had three all of the tension and compromise and ultibroad, deep commitments while I was grow- mately the cooperation that went into melding ing up. Doane Stuart was lucky to be one of the Sacred Heart model of Kenwood with the Episcopalian day school model of St. Agnes. them. I imagine that perhaps she did not say much First, she was committed to her family: to her in these meetings. I think instead she listened marriage to my dad, forty-five years strong intently, trying to understand the politics and next month; and to me and my two younger the positions, and carefully choosing those brothers. Second, she was committed to her moments when she would speak up in favor of career. Mom was one of only twelve women realizing the dream of continuing both schools in her Albany Law School graduating class of in an unprecedented and innovative model. 40th anniversary alumni spotlight arms. She gave a good hug. Despite my requests for more, this was allowed only once per meeting. Mom’s service on the Doane Stuart Board started when I began preschool, and ended when my youngest brother headed off to college. It included several years as President of the Board and was just about exactly coterminous with her years of heavy household and childcare responsibilities. Our dining room table was her work space. It had a section for bills; a section for permission slips, report cards and other school stuff for my brothers and me; a section for the New York State Department of Public Service; and a section for Doane Stuart. When the ImaginAuction came around, the colored index cards came out. One color for each section of the catalog, and each card bore a witty Jean B.-drafted description. and they peeked in from the residential corridor that connected to the chapel from the other side. They took in the whole spectacle, beginning to end. They were there not only to watch and bless the marriage, but also to celebrate my In 1996, I got married in the Doane Stuart, mother. They knew her. They had observed at that time also the Kenwood, chapel. It had her loyal and dedicated and top-quality work been fairly typical for an alum to secure the on behalf of the school. Her devotion to a chapel for a wedding, although this was one of cause was something they understood. the last that they allowed there. Our family’s Catholic priest and my husband’s family’s Con- And so let me close by saying to Doane Stuart, gregational minister jointly celebrated the ser- and to you its alumni -- Thank You. Thank you vice, and Mom and Dad both walked me down for understanding and appreciating my mom’s long and deep loyalty to this institution and for the aisle. honoring her with the Head of School award As the service began, the sisters of the Sacred today. Heart gathered around the edges of the congregation. They filled the balcony, and that little room off to the right side of the main entrance, In 2015, at the The Board met every third Thursday of the fall reunion weekend, month. On Board nights, mom and dad ofJean Cleary was ten did a hurried handoff at our front door and presented with the then we had leftovers, or one of Dad’s specialHead of School Award ties. When there was a Doane Stuart crisis, for her years of there she was on the phone, overseeing homework in between calls and letting other things pile up. She always gave maximum attention to the project of finding a new Head of School; she understood the importance of leadership, and always said that the pleasure of serving on the Board came out of her respect for and support of the vision that Heads of School had for Doane Stuart. Those Heads of School and everyone who has worked on Doane Stuart have done all right, too. Look at the thriving institution that has come out of all of these efforts. It is a beautiful thing. 40th anniversary faculty spotlight nomena of the natural and mathematical worlds, to understand that the seemingly simple hides much complexity, while the apparently complex can mask a beautiful simplicity at its core. A critical part of Seamusâ&#x20AC;&#x2122;s work with his science students is to teach them the skill and the art of scientific writing. Students practice writing clear, organized and concise laboratory reports, with ever increasing independence and fluency, as they move from fifth through eighth grade. Seamusâ&#x20AC;&#x2122;s strength as a teacher is in his uncompromising devotion to the preparation of young students who can think, imagine, explore, experiment and write as scientists, and who will take their preparation and go on with passion and confidence to more advanced scientific study. With a laser-like focus on building the basic foundations of scientific learning in Middle School, Seamus provides our students with the essential tools to be the innovators of the future. As a teacher, Seamus believes that it is his mission to teach not just the minds but also the hearts of his students, to remind them every day of their duty to understand and respect others. As a teacher at Doane Stuart, he lives every day with a compelling combination of wonder and responsibility. Whether he is inspiring students in science or math, or coaching students on the soccer field or the track, Seamus is a role model for a purposeful, inquisitive, joyful, moral and peaceful way of life.   Our Green Roof serves as a living science lab. During the planning stages of our roof, students in our Upper School Green Roo Class participated in discussions of the landscape design, which includes a patio, central garden, outdoor science lab, and accessib green space. Students also studie weather patterns, seed dispersal, and biodiversity to determine the types of plants and animals t could thrive on the roof. Students in the Lower and Midd School will also benefit from the Students will study plants, anim the environment, and weather p They can measure the environm impact of the Green Roof by tak temperature readings from the classrooms below. After collectin and analyzing the readings, stud can gauge the roof ’s impact on e usage. Students of all ages learn make an hypothesis, collect data results and present their finding Doane Stuart values learning by and the Green Roof is the perfec laboratory. Architect: Mesick, Cohen, Wilson, Baker, Architects Construction Services: Sano-Rubin Construction, LLC Green Roof Professional: Edmund Snodgrass of Emory Kno Green Roof Installation: APEX Green Roofs Inc. 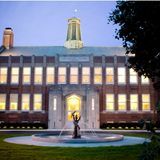 The Doane Stuart Green Roof Project was substantially funded by the New York State Environmental Facilities Corporati Green Innovation Grant Program.                                 In May of 2014, Doane Stuart began construction on a 22,000 square-foot vegetative roof.                            . 80 o during the summer, reducing cooling costs. of C0 2 annually, improving air quality. in cold climates, reducing heating costs. INDIVIDUAL plants make up our Green Roof. This will be a quote about the importance of STEM and/or STEM at DS. This will be a quote about the importance of STEM and/or STEM at DS. This will be a quote about the importance of STEM and/or STEM at DS. This will be a quote about the importance of STEM and/or STEM at DS. This year students in the 3rd and 4th grade have been diving into exciting STEM related projects with the help of Mrs. Tami Schillinger (Olana Schillinger ’24) and Ms. Jennifer Hess (Ana Van Plew ’23 and Nick Van Plew ’21) who have volunteered their time to guide the group through a variety of projects that utilize a number of different skills and processes. STEM education is an interdisciplinary approach to learning that removes the traditional barriers separating the four disciplines of science, technology, engineering and mathematics, and integrates them into real-world rigorous and relevant learning experiences for students. The engineering process is accomplished through Project Based Learning (PBL). Students go through an extended process of inquiry in response to a complex question, problem, or challenge. Rigorous projects help students learn key academic content and practice 21st Century Skills, such as collaboration, communication & critical thinking. carry out challenges related to the theme. So far, this year groups have participated in activities and tasks centering on shelter, and what factors might one considered when building a shelter for different climates. Students also learned how different shelters were constructed in the past when materials and/or resources were limited. Students were asked to brainstorm the different types of weather that would affect the kind of shelter they would build, as well as how to best construct their shelter based on those types of weather. Then, as a final test, both the shelters were tested under the extreme conditions one would expect during a storm. Following the great success “Shelter Challenge” completed two additional STEM. In November the students completed the “Magnetic Challenge.” They were asked to take on the role of a Civil Engineer, Activity Director, Magnetic Artist and Mechanic while designing a make-believe city made of magnets and magnetic reactions. The “mayor” then asked the group of engineers, designers and builders to design and construct a prototype of “Magnet Land,” Albany’s newest attraction! It was required that each prototype include landforms, a magnetic form of transportation, a magnetic sculpture (3-5 inches tall), a magnetic game or activity and one levitating magnet. a make-believe city made of magnets and magnetic reactions. The “mayor” then asked the group of engineers, designers and builders to design and construct a prototype of “Magnet Land,” Albany’s newest attraction! It was required that each prototype include land-forms, a magnetic form of transportation, a magnetic sculpture (3-5 inches tall), a magnetic game or activity and one levitating magnet. In December, the students embarked on their next STEM project, the “Roller Coaster Design Challenge,” a fun introduction to the world of friction. The roller coaster, built with foam tubing, was required to have at least one loop and a “sideways twister.” In order for a group to have a successful run, a marble needed stay on the roller coaster track and land in a cup at the end. Through much trial and error students learned about the relationship between mass and force, The students joined together once a week to and how changing aspects of their design would affect the speed and accuracy of their roller coastwork on the projects, and after days of work and er. The students also became familiar with key experimenting with different types of magnets, physics concepts such as velocity and accelerametals and building materials, the groups pretion. sented their models to a construction engineer to be inspected and evaluated. Allen form a company at this time called Micro Soft in Albuquerque, New Mexico, to develop and sell BASIC interpreter software for the Altair 8800. 2015 Reunion was a great success. This year’s Reunion celebrations were kicked off with a cocktail reception in the John B. Robinson, Jr. Board Room and on the Green Roof (for those who didn’t mind the chilly temperatures). The room was filled with alumni/ae, faculty (current and past), and trustees. Everyone enjoyed looking through yearbooks, viewing the 1st Annual Alumni/ae Art Exhibit and reminiscing. Some saw friends they haven’t seen in many years while others were making new friends. We presented the 2015 Alumni/ae Award to Andrew Kauffman, DS ’10 at the Friday evening reception. On Saturday, Sr. Canty launched the day with an opening prayer; Leanne Robinson, DS ’94 and Peter Kutchukian, DS ’97, Co-Chairs of the Alumni/ae Association, presented the 1st Annual Meeting of the rejuvenated Alumni/ae Association and Pam Clarke, Head of School gave a State of the School address. We then moved into the Commons where Bishop Ball offered the blessing and we all shared the most amazing feast. After lunch we honored this year’s anniversary classes and presented this year’s Head of School Award to Jean K. Cleary, KA ’59. Leanne Robinson-Maine, DS ’94 & Peter Kutchukian ductions in various capacities. She was Writer/ Producer on the award-winning independent feature documentary So Right So Smart narrated by Daryl Hannah (2009), which received a national release on PBS this year. She has received numerous Telly awards for her corporate and commercial video writing and editing work. Leanne is the Event Producer at USGBC’s Greenbuild Conference, which annually brings together over 10,000 attendees Leanne Robinson is a celebrated Producer, Writ- in arenas across the country, and has featured er and Editor. With a BA in Communications such speakers and talent as Hillary Clinton, & Theatre from The University of Notre Dame Desmond Tutu, Colin Powell, Al Gore, Bon and an MFA in Theatre from Ohio University, Jovi, Sheryl Crow and Maroon 5. Leanne attributes her passion for language and Leanne and her husband Justin have two storytelling to her background in drama. After daughters. Violet is 5 and Ava is 3. 3 years as a Trainer and Instructional Designer Leanne’s hobbies are singing, acting, and choat Trans World Entertainment, in 2006 Leanne reographing Flash Mobs for family functions. found the perfect fit for her unique combinaLeanne most recently coordinated a family tion of meticulous organization and out-of-the box imagination: Video and Event Production. Flash Mob for her brother Greg’s wedding. What is her favorite memory about Doane StuSince then she has worked on dozens of proLeanne is the sole proprietor of her own company, Creative Circus LLC, which she started in 2006 and is now mainly focused on contracting for MagicWig Productions, Inc., of which her husband Justin is a co-owner. art? Leanne says that is the hardest question to answer! But she says one of the things she always thinks very fondly on is having the chance to dedicate “Now and Forever” to my classmates & faculty at our graduation in the chapel. The fact that she “found her voice” both figuratively and literally at Doane Stuart (she says thank you to her Drama Teacher, Robert Whiteman, for encouraging her to take voice lessons!) made having the chance to sing it even more meaningful to me. The words of that song still really capture how grateful she felt to be a part of the Doane Stuart community. "Didn't we come together, didn't we live together? Didn't we cry together, didn't we play together? Didn't we love together? And together we lit up the world. lect compounds to carry forward during drug discovery campaigns - married his interest in psychology, which began in Psychology class back at Doane Stuart with Miss Wallingford and resulted in numerous training experiments on the family cat, with his interest in chemistry, which began with a less than noteworthy performance in Chemistry with Mr. Priest. In 2013 he joined Merck as a cheminformatician, where his current research focuses on using big data and machine learning to support the discovery of promising new therapeutic targets from phenotypic screens. He is currently editing a book entitled “Chemical Biology Informatics and Modeling.” Peter has one son Benjamin who is 14 years old. $20,000 - $24,4999 Ms. Winifred A. McCarthy, KA ‘66 The McCarthy Charities, Inc $10,000 - $19,999 Ms. Pamela Clarke Mr. and Mrs. Andrew Gorelik Mrs. Elizabeth Ramsey, SA ‘36* $5,000 - $9,999 Bernard & Millie Children’s Foundation Drs. Alan and Maria Boulos Dr. Terrence Flannery and Ms. Maria Holden Mrs. Victoria Hans ‘78 Mr. Thomas Lagan and Dr. Ginna Roeding Mr. Robert L. Morse and Mrs. Susan Rose Morse, ‘89 Regeneron Pharmaceuticals, Inc. (Mr. Daniel VanPlew) The/ Lawrence I and Blanche H Rhodes Memorial Fund Inc. (Ms. Barbara Egnot) Mr. and Mrs. John B. Robinson, Jr.
academics and college entrance rates are a big draw for Doane Stuart, the safe and challenging learning environment is an important factor. Stock certificates may be transferred to Doane Stuart to be sold by us. Transferring stock directly from broker to broker avoids personal income tax. For stock transfer instructions contact the Development Office at (518) 465-5222, ext. 203. Andrew Nakushian ’16 honored his teacher and friend at señor Febrey’s memorial Service in January 2016. A hat trick in soccer or hockey is the ultimate accomplishment. To score 3 goals in a game is a tough but not exactly rare feat. But to have two players score a hat-trick in the same game for the same team is almost unheard of. For comparison purposes, the English Premier League has only ONCE (since 1992!) seen two players score a hat trick for the same team in the same game. Louise Metz ’17 of Troy (midfield) and Antonia DiPreta ’18 of Clifton Park (sweeper) amazingly completed a double hat trick during a 6-0 victory against Rensselaer on October 7. This marked Antonia’s first hat trick of her DS career and lifted her total to 7 goals on the season. When asked to describe one of her goals from the game, Antonia deferred and shared the credit with her teammate, “[The goal] came off a beautiful cross and I made a run to the near post. When Louise crosses it over, I usually know where the ball is going.” Louise had a second hat trick two days later in their next league game, this time in a 5-0 victory over New Lebanon. Scoring backto-back hat tricks is also a rarity (achieved only 4 times in the Premier League). For Louise, this gave her (at the time) 11 goals on the season and 5 career hat tricks. Not too shabby for someone who normally plays defense on her club team! The girls soccer team hit the Northway and traveled to Fort Ann for the opening round of the 2015 Class D Sectionals. Although they didn’t move on to the next round, the 2015-2016 was undoubtedly a huge success for the lady Thunderchickens. Grab some peanuts and Cracker Jacks because baseball is back at Doane Stuart! This was not an easy endeavor, though, as it took five years and at least one failed attempt before getting to this point. Fortunately, DS has a group of very committed students with a passion for the game. Coach Jim Wheaton, Doane Stuart’s new Upper School history teacher and new head coach credits Thomas Kirby ’18 of Athens, Michael ’17 and Kyle ’19 Jakovic of Albany and Sam Kinum ’17 of Delmar with working hard to build interest in a team for the 2016 season. In a smaller school with other very established spring sports, drumming up interest proved to be a bit difficult. So Thomas, Sam, Michael and Kyle asked Mrs. Clarke to approve a team and then convinced their classmates to sign up for it. have played fall ball and have more experience, others haven’t played in a couple of years. We even have two of our Chinese students – Sam and Chris – who had never really even picked up a baseball before.” With this mixture of ability levels, no one was sure how the team would do. To be 3-6 at the halfway point of the season is a testament to how hard everyone has worked. This is also a team currently without a home field, opting to play all their games on the road. One of the highlights for the season came in the fourth game, a 3-2 victory over Heatly, Doane Stuart’s first win of the season. In that game, Doane Stuart ace Dan Sausto ’16 of Slingerlands fired a complete game, 7 inning 13K performance. At one point he mowed down nine Heatly batters in a row! Not one to rest on his laurels, Doane Stuart’s version of Nolan Ryan set what is believed to be a school record by tossing a complete game 18K masterpiece last week against Berlin. Dan issued one walk and allowed no earned runs. For a point of reference, the max number of strikeouts in a seven inning game is 21. Dan was three strikeouts away from a truly ridiculous and momentous feat: a perfect 21 strikeout game. In his three starts this year he has amassed impressive totals of 13, 13 and 18 strikeouts. 40th year in review allowed in Sectional play. Several players were honored with end of season awards by the Central Hudson Valley League. Kyle Jakovic ‘19 was named a Second Team Allstar, brother Michael ‘17 was named First Team Allstar, and the team’s lone senior, Dan Sausto ‘17 was named the league’s Co-MVP. The team was honored for it’s high class in its wins and losses, with the league Sportsmanship award. Finishing 7-7 in the first season back after such a long hiatus in the program is impressive in its own right. The buzz and pride in the school is only matched by the congratulations and complements the team has received from the various communities from which our students come, but also from observers of CVHL and Section II baseball. We look forward to another exciting and competitive season next year. At the biggest track meet of the indoor season – the New Balance Indoor Nationals, run by the NSAF (National Scholastic Athletic Foundation) – Shea Weilbaker ’19, of Saratoga Springs, turned in his fastest mile to date, a blistering 4:38. Shea was one of 31 freshman milers from across the country that ran the sub 4:40 mile required to qualify for the Indoor Nationals, held at the Armory in New York City on March 13. At the Indoor Nationals, Shea encountered the best runners he had ever competed against. The stellar level of competition helped push Shea to his personal best of 4:38, which was good enough for 18th place for all freshmen throughout the country. His time also was fast enough to earn him second place for New York State. His time marks an incredible improvement since late December: he ran his indoor mile then in 4:46, which was good enough for second place in a freshman and sophomore race. To cut almost 10 seconds off of his indoor mile time in just under three months is remarkable. Even more impressive, though, is that Shea is still relatively new to running. He had only seriously trained for about four months! Meghan Araldi ’16 of Westerlo and Patrick Gorman ’16 of Hoosick Falls for their selection as the Doane Stuart boys and girls basketball scholar-athletes for the 2015-16 season. Both students exemplify the ideal of a student-athlete and we are pleased to offer this recognition. They were selected by Athletic Director Pat Light and Associate Head of School Lisa Brown. Congratulations, also to Meghan and Thomas Mathes ’16 of Coxsackie, for being named CHVL (Central Hudson Valley League) second-team all-stars for basketball for the 2015-16 season. For Meghan, this dual recognition as a second team all-star and scholar athlete speaks to her hard work, talent and dedication. DS proudly hoisted the blue and green flag over the Rensselaer County Courthouse for the second year in a row. Our Mock Trial team completed Back-to-back Rensselaer County Championships and had another undefeated run to victory! In this year’s county final, Doane Stuart beat Catholic Central in a close competition. Both sides performed admirably and Catholic Central fought well. Doane Stuart also beat Columbia High School twice and Emma Willard in the lead up to the County Championship. Catholic Central beat La Salle in the other semi-final match up. Up next for the Mock Trialites was the Northeastern New York Regional. On April 2, 2016 at the Wolferts Roost Country Club, we raised more than to benefit both Faculty Salaries and Financial Aid. Hodgkinson, Senior Faculty Member. We are also indebted to our friend LeGrande Serras, who thrilled us all as we raised the most funds ever at the Gala. We thank Corporate Sponsors, Honorary Committee Members, Parents, Past Parents, Alumni/ae and guests for their continued support for our faculty and students; we could not do this without all of you. Around the world with DS tween the two schools. The school, Colegio Los Sauces has 5 campuses (four in Spain and one in Dublin). Ms. Bracken visited the four campuses in Spain, two located in Madrid (Torrelodones and La Moraleja), and two in Galicia (Pontevedra and Vigo). Ms. Bracken toured Los Sauces with members of the School’s Admiinistration during her visit. We are from the same area. Bad things happen, and we can’t ignore that, but we are friends. It requires conversation but we can find a way to live together.” holidays from the Chapel program and from the Jewish and Muslim students that attend the school. We wanted to share our culture by giving them a taste of the food of the streets.” They wanted to prepare food that was known to Arabs and Jews, and they wanted it to be as authentic as possible. So Shira and Fadi donned aprons and have spent hours preparing the traditional feast. Dave and Mike Foley happily joined in to make this unique lunch a success. Cuba, Mexico and Puerto Rico? This reamined the case for many years. Now, DS welcomes most international students from China. Families learn about Doane Stuart from you - every single member of our community. Our students, parents, teachers and alumni/ae are our greatest advertisers and ensurers that THE NEXT 40 YEARS will be the best they can be and that the students who will get the most out of a Doane Stuart edcuation find their way to us. This is our message, in the worlds of members of our community as the speak to prosepcive famileis at an Open House. It’s a message our community tries to deliver at Open Houses, school fairs, even during a improptu conversation at the grocery store wtih a parent hoping to learn more about the culture, academics and spirit their child might find at Doane Stuart. concert; Robert Weaver’s music class performs once each week; processionals and recessionals are played by Dawson or Stephanie, occasionally a bagpipe solo by Dalton. Parents and alumni/ae and friends join us here for special gatherings; the Christmas Chapel, with music and light and toys donated for those less fortunate; Graduation, where we say a bittersweet farewell to young adults we have known since they toddled into the nursery, or awkwardly bound into middle school, or rocked into the high school with that almost completely fake facade of “cool.” In this room skills are taught: a very particular skill is taught in this room: students speak here in front of their peers and their teachers every time we enter the room. A pair of seniors orchestrates our assemblies; 4th graders guide us all through the pledge of allegiance before describing the week’s learning of the Kindergarten-4th grade classrooms, and then a middle schooler reports on the explorations of grades five-eight; students are important speakers at every gathering. A by-product of learning to speak in public is learning to sit quietly and listen -- all our students practice attentiveness and purposeful listening, with only an occasional reminder from an adult. So I think of this room as the place where Doane Stuart is most Doane Stuart- and we all are at our best- singing, praying, laughing and learning—all in the glow of this lovely room. I am going to speak very briefly today about teachers and teaching at Doane Stuart (which, of course, means talking about students!) but I‘d like you to see my show and tell first and ask you a single, simple question. What do you see? Please think about it as I speak. In my art history classes, we have been reading and thinking about vision and seeing, the process of what James Elkins calls “ mechanism and metamorphosis.” Seeing makes our mechanical or physical process of vision meaningful. A learning process, it sifts through our collected memories and experiences to translate the data that our vision collects. . My students and I become more and more fascinated by this idea. They have 16 or 17 years worth of memories and experiences; I have a few more than that. What happens when we look we look at a painting together? We see the same thing . . . Spreading the word what they do; care deeply about students, personally and intellectually; are passionate and knowledgeable about why, how and what they teach . . . they are teachers who inspire. Einstein also said “Imagination is more important than knowledge.” And what is imagination? Imagination is being able to see the world that isn’t yet here. We need our kids to be able to see that world, to use the data their vision collects to see beyond what they know – and to have the confidence and competence to make their own discoveries. Our teachers help them do just that. If you take naturally curious and inventive kids and mix them up with talented, knowledgeable, curious and caring teachers in a school that celebrates inquiry, discovery and the rigor of learning, you have a wonderful mix of connection, inspiration – and to use another meaning of the word -- vision. If you allow the magic of discovery and learning to thrive (it is part of our mission), and if you believe in the importance of giving time and commitment to the process that helps kids truly see the world, you change lives. That’s what we do at Doane Stuart. Today you will have the opportunity of meeting and talking with our teachers and students, and sitting in on classes, experiencing the heart and soul ¬– ¬ the art, the science and the magic – of Doane Stuart. Have fun! You will make connections with some excellent people, and I think that you will be inspired to return. I started out asking you to look at these paintings: “The Annunciation,” one of my favorites, by Jan Van Eyck, from c. 1435, and “Three Musicians,” by Fernand Leger, a 1944 painting based on a drawing from 1924. I hope that you will have a moment to take a closer look and tell me what you see! “We’re not given a formula and told to use it; we discover the formulas. I remember the day that we spent an entire class period deriving the quadratic formula. We weren’t even quizzed on it -- it was solely for our own understanding...and it worked!” is learning about the solar system, and that the eighth grade is selling pies to raise money for their annual trip to Washington DC. I’m going to miss the community so much, but being a part of it has prepared me for my next step. I was so skeptical about coming to Doane Stuart when I was in eighth grade, but now, I’m a believer. Hello: My name is Jonny Hacker, and I am a senior and the student body president at Doane Stuart. 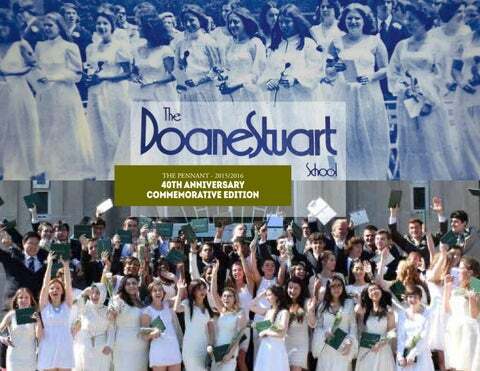 This is the 40th Anniversary of Doane Stuart. I have been here for 12 years, although sometimes it does feel like 40! I say that because I can now look back on my 12 years and realize the impact Doane Stuart has had on me. 2016 get a ‘no way.’ What I always tell them is that I am good friends with every one of the kids in my grade. We are too small a school to be clicky. I am good friends with my teachers, too. Every day you will have a real in-depth conversation with at least three teachers outside of class. You may be thinking, “Wait Jonny, you’ve been here for like 40 years, of course you know everyone well.” Well, I recently talked to my new friends from Ireland – the exchange students who have been at Doane Stuart for fewer than three months –and they are great friends with everyone already, and they are loving their time at Doane Stuart. So whether you’ve been here all your life, or you just got here, I really believe Doane Stuart is the place to learn and to grow, to make friends in the process and to prepare yourself for whatever may lie ahead. Each week, my office has the pleasure of chatting with students and families interested in attending Doane Stuart. Families seek Doane Stuart for the strength of our academic program, our dedicated and caring faculty, the warm, welcoming nature of our interfaith community and our success in graduating students who attend highly selective colleges and universities while pursuing lives of meaning and purpose. Suffice it to say, I love my job. I get to share this amazing school with our visitors. As an Admission Office we are cheerleaders for the school, proudly sharing this great story with the broader community. Our day-to-day work allows for interaction with kids pre-schoolers to high school upper classmen. We hold their hands for the first time as they nervously walk down the hall to Mrs. Stauder’s or Mrs. Cassant’s classrooms. We watch students develop public speaking skills and grow at Lower School morning meetings. We watch Middle Schoolers conduct independent, self-directed research that they proudly present at their Illumination Fair. We see Upper Schoolers win league co-MVPs, earn trophies for our Mock Trial team, compete nationally in track and crew, perform on stage and hopefully attend their dream schools. We see highs and lows; good days and bad; laughter and tears. It is a wonderful challenge and a privilege to be here and share this community with prospective families. In the past year we made significant changes to our open house program. We desired to offer a program that showcased the core of the Doane Stuart experience: excellent teaching, active collaboration and eager and bright students. We replaced the campus tour with faculty-led classes and a student and faculty panel. Now, families have the chance to learn about the solar system and second grade with Mrs. Garrison, analyze poetry with Dr. Foster in an Upper School English class, explore imaginary numbers with Mrs. Bemis in Upper School math and experience Middle School history with Mrs. Baillargeon and her various period costumes. To quote a visitor from one of our open houses: “Mrs. Morgan [Middle School Science] was AMAZING and truly the best part of the visit.” When asked about our student ambassadors, our visitors were equally effusive with praise: “[the students were] incredibly impressive! Will, Henry and [Monica] were all charming, at ease and informative.” I hope you enjoyed the excerpts of the speeches that were delivered at our four Saturday open houses this year. Individually and collectively, they should paint a familiar picture of the school we all know and love. Mr. Bowman received his B.A. in History from Union College in 2004. Upon graduation, he began his career in higher education as an Assistant Dean of Admissions at Union and then as an Associate Dean. He joined Doane Stuart in July of 2012 as the Dean of Students for the Upper School. In addition to his role as Director of Admission, Mr. Bowman also teaches history. Anniversary Speaker Series Doane Stuart welcomed three accomplished and captivating guest speaker throughout itâ&#x20AC;&#x2122;s 40th year. They engaged our community in topics we all think and care about: the emotional lives of children, the health of our planet and our realtationship with food and physical health. Anniversary Speaker Serires “Raising Cain” that was broadcast nationally in 2006.
visited Doane Stuart as part of our “Excellence in Science Night” cleberating the School’s commitemnt to the sciences. Mr. Neill is the founder and director of the World Ocean Observatory (worldoceanobservatory.org) a web-based place of exchange for information and education about the health of the ocean. Neill previously served 20 years as President of the South Street Seaport Museum, New York, is co-founder of The Sound School and The Harbor School, and has dedicated his career to marine affairs. His most recent book, The Once and Future Ocean: Notes Toward a New Hydraulic Society, is now available. 40th year in review With honesty and humor, her presentation addressed the food challenges we face and the value of having your own nutrition wisdom. Dr. Marinello is an Associate Professor of Nutrition and Chair of Nutrition Science at The Sage Colleges in Troy, New York. She has earned undergraduate degrees in Biology and Nutrition Science, a M.S. in Natural Sciences and a Ph.D. in Molecular Biology. She is an experienced research scientist and nutrition educator. Her interests include the role of nutrition and genetics on health, athletic performance and weight management. Dr. Marinello is a member of The American Dietetic Association. For seven years she was The Healthy Professor columnist for the Albany Times Union writing on nutrition and wellness and continues to write a blog for Times Union online. Professor Marinello lives in Albany with her husband, Dr. Anthony Marinello. Both are from Brooklyn and met 42 years ago on the first day of college in Biology lab. They have 3 children, all Doane Stuart graduates, pursuing careers in medicine, law and educationâ&#x20AC;Ś enough said.